Some tools only accept layers or layer files as input or output. If this is the case with the tool you are using, the display name for the parameter will contain the word layer (for example, Input Feature Layer rather than Input Features). Using a layer instead of browsing to the dataset on disk is natural and intuitive. But there's much more to using layers than as a simple shortcut to a dataset on disk. 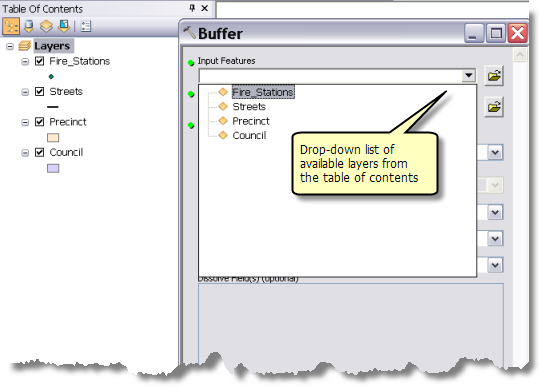 Layers and table views can contain a selection of features or rows, and geoprocessing tools will perform their operations only on the selected features or rows. 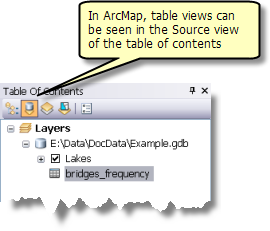 Layers and table views don't have to come just from the ArcMap table of contents. You can create them with geoprocessing tools so that they can be used in ArcCatalog. Layers are short lived; you need to be aware of this when writing scripts and models, since the layer may not exist when the script or model is run at a later time. The "Make Layer" tools—for example, Make Raster Layer—create a layer from the input data. This layer is temporarily stored in memory; it is not saved on disk and only remains available within the current session. If the session is closed, the layer is deleted. Layers created in ArcCatalog cannot be used in ArcMap, and vice versa. ArcCatalog does not display created layers, but they can be used as inputs to other geoprocessing tools in the session in which you are working. A layer or table view contains a selection, sometimes called a selection set. A selection is a subset of the features in a feature class or a subset of rows in a table. There are a variety of ways you can select features in ArcMap, such as drawing a shape on the map display to select all features within the shape or using a logical expression. You can also select features and rows using geoprocessing tools found in the Data Management tools Layers and Table Views toolset. 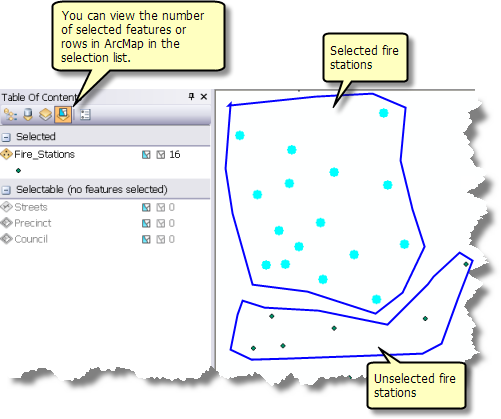 In ArcMap, you can see the number of features or rows by clicking the List By Selection button found at the top of the table of contents, as illustrated below. Almost all geoprocessing tools operate only on the selected set of features or rows. For instance, the Clip tool only uses the currently selected features in both the input features and clip features datasets. The Summary Statistics tool calculates statistics only on the selection. In fact, it is rare that a tool does not operate on selected sets of features. If the tool does not use the selected set, the tool reference page explicitly states that it does not use the selected set. Tools that modify the schema of a feature class or table, such as Add Field, do not use the selected set since it is impossible to add fields to one set of records and not another. If the input to a tool is a time-enabled layer, only those features within the specified time period set by the Time Slider window will be processed. With time-enabled layers, you can think of the Time Slider as a way of selecting features for further processing. You don't need ArcMap in order to create layers. You can use the Make Feature Layer tool found in the Layers and Table Views toolset to create an internal in-memory layer of a feature class in ArcCatalog. Regardless of where the layer is kept, the layers will be shown to you in the same drop-down list in the tool dialog box. If you execute Make Feature Layer in ArcMap, the layer can automatically be added to the ArcMap table of contents by enabling the Add results of geoprocessing operations to the display option. In this example, the variable landuse_layer is "hard coded" to Zoning. Later in the script, the landuse_layer variable is used, and the script returns an error because there is no layer with the name Zoning in the current application. The script works fine if you execute it in ArcMap with the Zoning layer in the table of contents but fails when you execute the script in ArcCatalog, or anytime that layer doesn't exist. A similar situation occurs in a model. You create a model where the Zoning layer is used, and the model fails because there is no layer by that name in the application. Make the layer name a tool parameter so the user can specify the layer name when executing your tool. Create the layer before running the tool. Create the layer within the model or script. In ArcMap, you are allowed to have multiple layers of the same name in the table of contents. When geoprocessing scans the table of contents to build the list of layers, it doesn't remove duplicate layer names, so the drop-down list of layers will contain all layers, regardless of whether the names are duplicated. If you pick a layer with a duplicate name, you have no way of telling which layer will be used. The best way to work around this issue is to use group layers, putting duplicate layers into different group layers. The following illustration shows two group layers in the ArcMap table of contents, each containing a layer of the same name. In the Add Field tool dialog box, the group layers are shown in a tree view, so you can pick the correct layer.